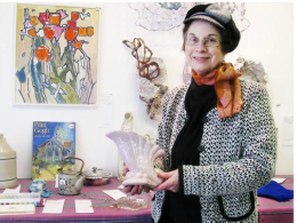 Joyce Honsberger AOCA, SSC, SCA, is recognized for her unique space sculptures. She works from her Wind Poppy Studio, an experience in wonderment. The space is a kaleidoscope of two and three-dimensional work. She exhibits extensively, and has represented Canada for the SSC, in Sweden, Mexico, and Australia to name a few. She is also a partner in The Jordan Art Gallery in Jordan, ON.